NICHOLS – Wilda Geneva, 95, of Edmonton, AB, formerly of Brooklyn, Queens County, NS passed away April 4th, 2013 at Sherwood Park Care Center, Sherwood Park, AB. Born in Brooklyn, Wilda was a daughter of the late Willis and Hattie (Clark) Spinks. 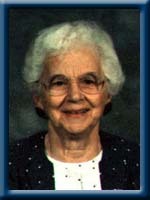 Wilda and her late husband Harry raised their children in Brooklyn before moving to Edmonton where Wilda lived for over 50 years and was a former employee of Moore’s Drugs and Woodward’s in the post office outlets. While in Brooklyn, Wilda was a member of the Brooklyn Baptist Church and the Women’s Institute. Wilda will be sadly missed by her sons William (Carolee) Nichols of Dartmouth and Eugene (Rosalie) Nichols of Sherwood Park, AB, her grandchildren Maura (Russell) Hart of Fall River, NS, Barbara Nichols (Royce Roenspies) of Prince George, BC, Suzanne Maier of Sherwood Park, AB, her great grandchildren Ashley Maier and Chelsea Maier of Sherwood Park, AB, Catherine (Neven) Wilson of Cochrane, AB, William (Cherise) Hart of Fall River, NS, her great great grandchildren Madisyn, Diane and Nevannah Wilson. Her brothers; Roland of Brooklyn, NS, Leonard of Mesa, AZ, Donald Eldon of Stanwood, WA. She was predeceased by her husband Harry Sylvester, her infant son Harry Jr., her sister Verta and her brothers Douglas and Bill. Our sincerest condolences to Rollie, Nancey & Mark at this very sad time. We send out condolences to the Spink/Nochles families. A few years ago, I got possession of an old autograph book probably from the 1930s. This book belonged to a Brooklyn girl named Wilda. After much research I learned it belonged to Wilda Spinks. I mentioned it to the late Florence Gardner, who told me she kept in contact with Wilda and through Florence I got Wilda’s address. I packaged up the autograph book along with a note and shipped it off to her. A few weeks later, I received a wonderful note from Wilda thanking me for taking the time to send her this long lost treasure. I still have her note and will always keep it. Though I have never met Wilda, I was very saddened to see she had passed away and it made me remember the story of the lost autograph book, a memory that I will always treasure. I would like to extend my sincere condolences to her family at this time. I was sorry to hear of Wilda’s passing. I do not remember her, but remember your Mom talking about her and my Mom always had fond things to say. Please take comfort in the company of family and friends at this difficult time. Rollie and Family…sorry to hear of Wilda’s passing.I’ll always remember her and Harry arriving and spending many summers in “the old green house”. We are friends of Lenny and Ruth from St. Albert AB. We had the pleasure of meeting Wilda one summer while Lenny and Ruth visited with us. She will be missed by Lenny very much. He is always telling or I should say retelling her stories. To Wilda’s Family, Sorry for your loss but she is now at peace. I was so sorry to read about the loss of your mother. It has been a long time, but I do remember enjoying good times at your home back in the 50’s. Please accept my sincere sympathy.